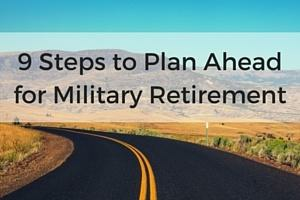 Retiring from the military is one of the biggest transitions you will experience in your life. While many service members and their families look forward to the next stage of their lives, others dread it, and it’s often because they are not financially prepared. You can avoid being in the latter group by starting early to strengthen your financial position. Here is a breakdown of what you should do and when. You must have 4 years remaining to transfer your Post-911 GI Bill. If you don’t plan to use all or part of your benefit, transfer it to your spouse and/or dependents, as described on the VA website. Service members who anticipate serving more than 20 years also have another deadline for transferring their benefit. DoD recently issued a change to the Post-911 GI Bill transfer policy. Effective July 20, 2019, service members with more than 16 years of total active duty or selected reserve service will no longer be eligible to transfer their benefit. Keep in mind that transferring your Post-911 GI Bill while still on active duty gives you flexibility to change the allocation post-retirement. You can decide to use the entire benefit yourself or you can change the allocation to give more or less to one of the original recipients. But after you’re retired, you cannot transfer the GI Bill to any new beneficiaries. Bottom line: transfer your Post-911 GI Bill asap to any dependents who might use it, and worry about the details after retirement. The important thing is that you lock in the option to save $100K or more in education costs. One of the best things you can do while you still have a steady, reliable income is eliminate debt. Start with the highest interest rate debt (usually credit cards) first. Set aside money each month to pay it down, and of course, don’t add to what you owe! Bottom line: Get out of debt before retiring. From this point forward, don’t buy anything you can’t pay for in full right now. That means no new car loans, and nothing added to your credit card unless you can pay the entire balance each month. 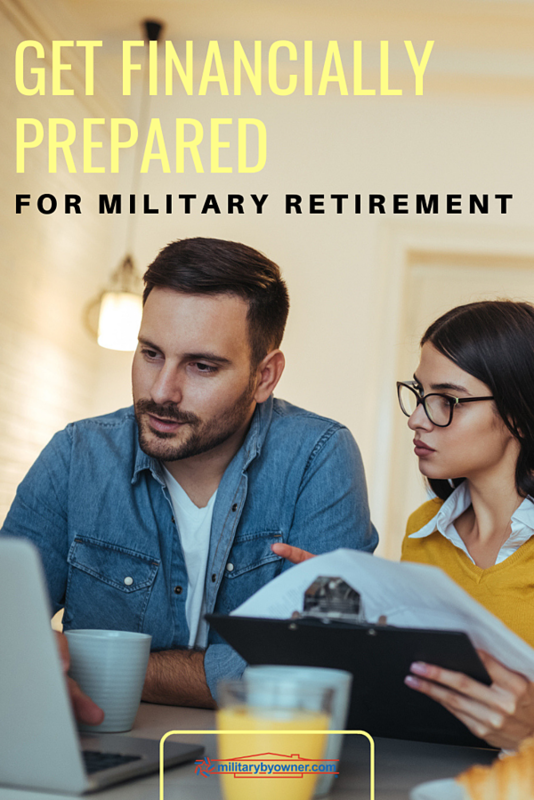 You may need this fund for extra expenses that arise during your transition or to bridge the gap between your last active duty paycheck and your first retirement and/or civilian paycheck. Calculate how much you need in this fund and divide the amount by the number of active duty paychecks you have left: that’s how much you should deposit in a separate account each paycheck to build your contingency fund. Keep in mind that after retirement, you will not receive BAH or free base housing. Start preparing to live in a smaller home by downsizing as much as possible. You want to avoid having to rent or buy a big house post-transition just to fit belongings that you don’t need. Start with those stored and unopened boxes that you’ve moved from house to house each time you PCS'ed. If you haven’t unpacked them in all these years, you probably don’t need their contents. Your goal is to reduce your belongings enough to fit in a future home that has at least one less room. Have semi-annual garage sales. Try selling items on Craigslist or at local consignment shops. Do whatever it takes to reduce your possessions. As you downsize, keep reminding yourself of how good it will feel to be lighter on your feet when it’s time to retire (and how painful it will be if you can’t afford a home big enough to accommodate your household goods). Bottom line: Beginning this process early will reduce the pain and allow you to gradually reduce your belongings. While you might land a management position or contracting job that comfortably replaces your military income, there’s no guarantee (and you might not be seeking that type of job, anyway!). In fact, there’s a good chance that your first job after military retirement – if you choose to continue working – will net significantly less than you’re taking home now, especially considering that all of the income will be taxable. Your retirement income will add to your total earnings, but it’s also taxable, and you won’t have other entitlements, such as free medical and dental care. With that in mind, it’s a good idea to “practice” living within a smaller budget. You must decide for yourself how low you can go, but as an example, some dual-income military couples try living exclusively on one of their respective salaries. Bottom line: Whatever method you choose to reduce your budget, you can use the money you set aside to pay down debt, contribute to your Thrift Saving Plan, or boost your savings. If you own your home and plan to PCS from the area, start preparing your home to sell. Begin researching or consult with a local real estate agent to decide what home improvements you should make to maximize the selling price. Possibilities could range from remodeling the kitchen or bathrooms to installing hardwood floors or replacing old appliances. You should also ensure that there are no structural issues (leaky roof, mold in the basement, etc.) that could surprise you at the closing and result in unexpected costs. Your ability to negotiate will greatly influence the salary you earn in your first civilian position. Some federal contractors may try to low-ball you because they know how much you make in retirement and will take your military retirement into account when formulating your offer. Other civilian employers simply don’t recognize that a senior enlisted or officer has the equivalent experience of managing (at least) a civilian company division. Bottom line: Your skills and experience are worth a lot. Learn to negotiate effectively to ensure you don’t leave money on the table. This isn’t financial preparation, but it could pay dividends later. Take advantage of your terminal leave to decompress, spend time with family, and get ready for the next phase of your life. You can sell back your leave to get some extra cash, but understand that you will only receive base pay for those days you sell back; BAH is not included. It is not a bad idea to earn your full compensation while investing the time to prepare yourself for success in the civilian world!